Oatmeal cookies, oatmeal protein energy bites, oatmeal for breakfast, you name it and we love oatmeal. Our lightened up cinnamon roll oatmeal made with real dairy milk even tastes like it has a cream cheese frosting! Better for you and better for your kids doesn’t have to mean only drinking Green Smoothies and elaborate meal planning. In fact, we’ve recently taught our 12 and 7 year old daughters to make this Lightened Up Cinnamon Roll Oatmeal and even our toddler goes crazy about it. In fact, our neighbor tried it and told us it’s hands down the best oatmeal she’s ever had. Not going to lie, that felt pretty darn good to hear. 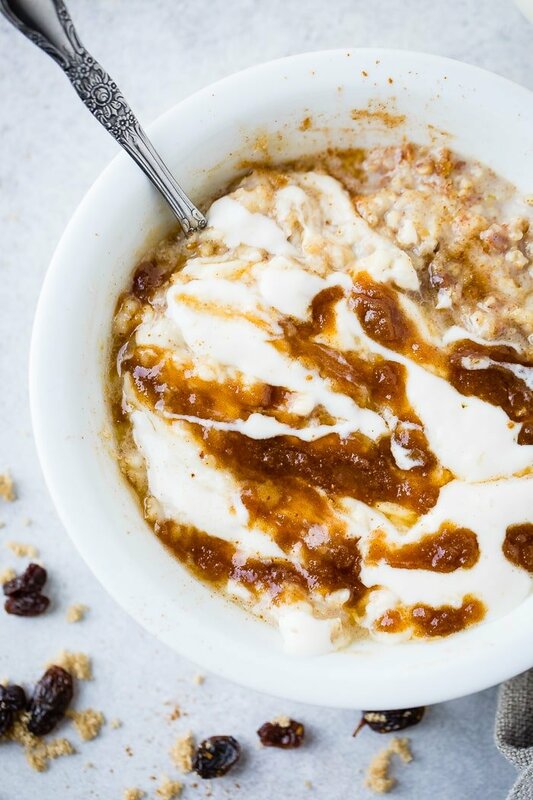 Something as basic as oatmeal totally gets a bad rap as being boring, but whether you’re looking to fill up those little bellies for learning all day at school or keeping them from standing in the kitchen begging for a snack all day this Lightened Up Cinnamon Roll Oatmeal has our family in love. No really, I’m not being cheesy, it’s that good. 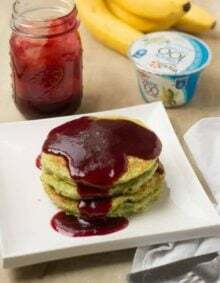 As you know from our post about 5 Snacks Kids Can Make that aren’t Junk Food, we’ve been looking for ways to incorporate milk and nutritious choices into our kids’ and our own diets this year, but what about the families that can’t do it for themselves? Just a few weeks ago our kids were getting out of school and they had a big dance festival. It was so fun to sit there and watch them doing their thing, but just the night before we had a dinner discussion about food and how when school lets out there are many kids who know that means the end of free lunch. More than half of kids 9 and up fall short on essential nutrients they need to grow strong – calcium, vitamin D and potassium. And when school lets out for summer, that risk may be even greater for over 22 million kids who are served by free or reduced-price meal programs during the school year. 22 MILLION! I can’t even wrap my head around that number, but we’ve teamed up with The Great American Milk Drive and Feeding America to make a difference. cannot reach children during the summer months when kids are at home all day. That’s why food banks play an even more critical role in helping children access nutritious foods when class isn’t in session. Critical being the key word. 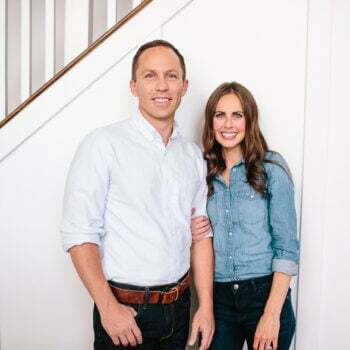 As you know, Cade and I decided that with a platform comes a responsibility to do something good, and 2018 was going to be our year to make a difference. Cade and I are donating today and we knew our readers would want to help the kiddos as well. play, learn and grow- just enter your zip code and your donation will go to a Feeding America food bank right in your own area. You can donate at select retailers or Milk Life . Online is how we are doing it. Just like a regular cinnamon roll you’ll want to create a brown sugar cinnamon filling. Just melt a little butter, add brown sugar and cinnamon and stir quickly until it’s all combined. I mean, you could use an equal amount of cream cheese instead of Greek yogurt, but why would you if you can substitute a more nutritious ingredient? Stir together plain or vanilla Greek yogurt with powdered sugar and you’re done. 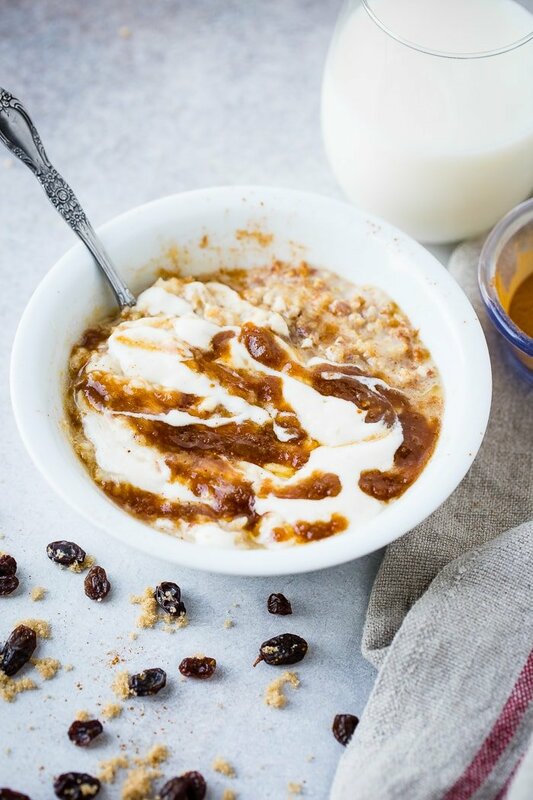 Once the oatmeal is cooked, brown sugar filling and glaze have been mixed, merely swirl it all over the top of your oatmeal. I love to throw in raisins, but listen, I know what a hot topic that is for all of you that aren’t into raisins. I mean, I think you’re crazy pants, but to each his own. While it’s not a perfect test, your senses are usually the most reliable tool to tell if your oatmeal has expired and gone bad. Dry oatmeal lasts for many years if stored properly, just watch for a change in color or texture. Do not eat it if it develops an odor or tastes different than usual. And no one wants their lightened up cinnamon roll oatmeal to taste nasty. One cup of cooked oatmeal contains only about 150 calories, four grams of fiber (about half soluble and half insoluble), and six grams of protein. To boost your protein further, just add milk! It has 9 essential nutrients, including 8 grams of high-quality protein per serving, and is the top food source of three of the nutrients most likely to be missing from kids’ diets – calcium, vitamin D and potassium. Oats provide minerals like thiamin, magnesium, phosphorus, zinc, manganese, selenium, and iron. 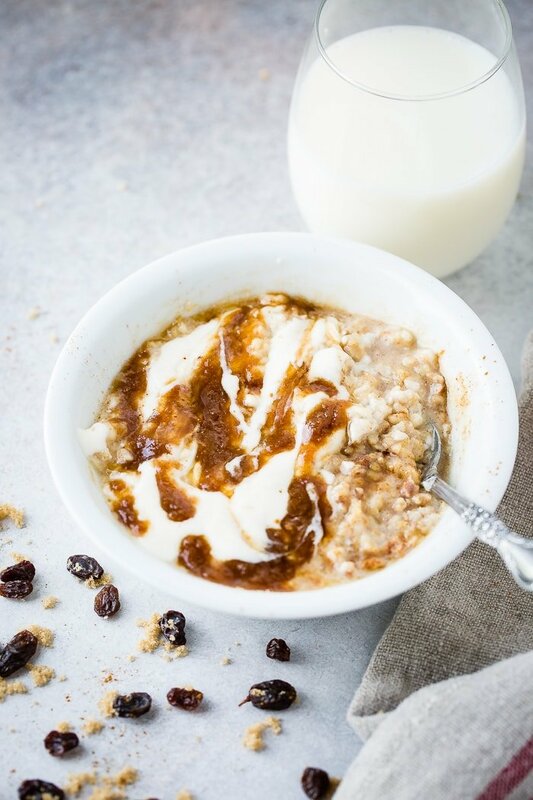 Lightened up cinnamon roll oatmeal is obviously not only tasty, but combined with milk it’s a great way to get nutrients into the whole family and start the day right. 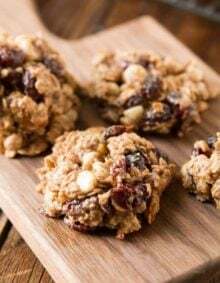 Oatmeal cookies, oatmeal protein energy bites, oatmeal for breakfast, you name it and we love oatmeal. 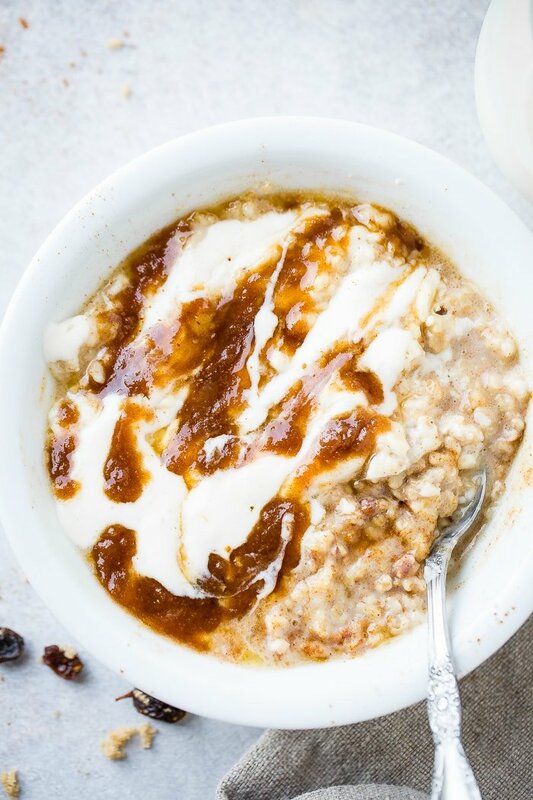 Our lightened up cinnamon roll oatmeal even tastes like it has a cream cheese frosting! Pour the milk, oatmeal and cinnamon in a saucepan and turn the heat to medium high to bring the ingredients to a boil. Turn down to medium low and simmer for 3-5 minutes. Remove from the heat and place a lid on it. Prepare the cinnamon roll filling by melting the butter and stirring in the cinnamon and brown sugar until combined. Prepare the glaze by stirring together the Greek yogurt and powdered sugar. Drizzle both over the top of the oatmeal in a bowl and sprinkle with cinnamon if desired. 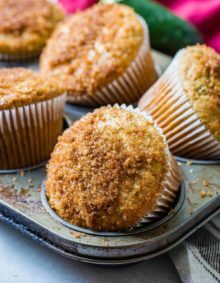 To make this using quick cooking oats: Bring 1 cup of low fat milk and cinnamon to a boil in a small saucepan. Stir in 1/2 cup oats and reduce the heat to medium; cook for 1 minute. Remove from the heat, cover and let stand for 2 to 3 minutes. Oatmeal is my favorite thing to eat! 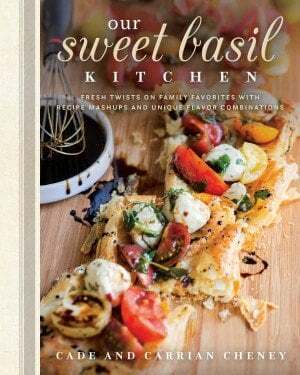 I’m excited to try this recipe. My mom would make a big batch of it once a week for breakfast and it never lasted long. We’d put a bit of brown sugar and cream in it…yum!!! Oh what a great idea! Did she just store it in tupperware ? Is it okay to eat oatmeal which had weevils in it in overnight oatmeal dishes?